The Creative City Project was started in 2012 by Cole Nesmith as a way for people in Orlando to discover the amazing talent that is to be found in the City Beautiful. The first year was small being produced with very little budget but the event has grown through the years. It is one of the signature Orlando events that I enjoy sketching each year. For the past five years the idea has been to present all this talent in one night, but this year the event has expanded to fill two evenings. This year I co-hosted ODD (Orlando Drink and Draw) on the first evening of Immerse. I set the meeting location at the former City Arts Factory which is a landmark familiar to most artists. 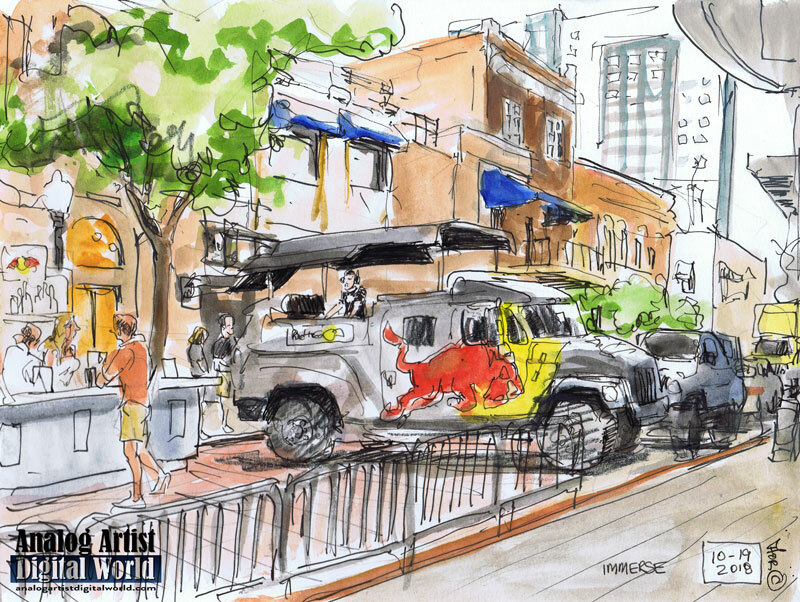 On that Pine Street block, the Red Bull truck was set up along with a bar to get the party started. I had already done 5 drawings that day of Story Corps interviewing people at the Orlando Public Library, so my parking spot had been found much earlier in the day. I thought I might be "Sketched Out" for the day but once I felt the energy of the event I had to put my pen to the page. Noga Grosman arrived and we considered the idea of getting a spot in an Orange Avenue bar and watching the event unfold from a bar stool. Other artist hadn't arrived yet, so I started this sketch and she sketched one of the five stages set up throughout downtown. Another artist had messaged that he might arrive about an hour late, so we both got busy sketching while we waited. A member of the Red Bull staff expressed an interest in buying this sketch and we will see if that pans out. A rap artist took to the Red Bull Stage and did a mic check for about half an hour. He then broke into an improvised rap in which he picked people out of the crowd and used their fashion sense as a spring board for his lyrics. I started to think that no other Urban Sketchers would show up, so I branched off to sketch at another stage. Immerse would be in full swing from 5pm to 11pm, so the night was young.